Enter Raven Claw 1, added to EWPMT ahead of the next capability phase (due in 2020). 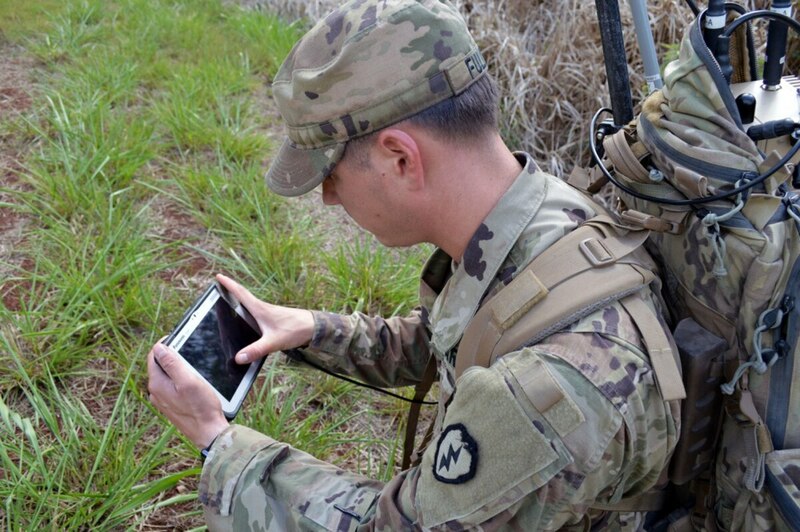 Raven Claw enables soldiers to conduct electronic warfare planning and management on the move and without network connection, getting at a critical need for troops in Europe, who are rarely tethered to a static command post. More specifically, Raven Claw adds capabilities so when electronic warfare officers are in a vehicle in the field, they benefit [from] real-time updates and the command-and control of sensors, as well as better communication with the command post in a degraded environment, according to Niraj Srivastava, a product line manager for airborne information operations electronic warfare systems at Raytheon. Army officials have lauded the overall Raven Claw process as a demonstration for how the service can more quickly provide capabilities to war fighters, while informing the program about future requirements based on solider feedback. The Army has received these results of the Raven Claw deployment to Europe, and one official described its results of the specific capability as mixed. “It does what it’s supposed to do, but it requires a lot of computing capacity and also it requires a lot of inputs from the [electronic warfare officers] right now,” Col. Mark Dotson, the Army’s capability manager for electronic warfare, told C4ISRNET in a November interview. Dotson said the service is trying to simplify the system and make it more user-friendly. “How do we automate some of the inputs so that it’s more user-friendly at the EWO level so they can actually go through modeling and sim without having to input each system individually?” he said. Raytheon has programmed in what it calls automated “plays” to help relieve the cognitive burden on electronic warfare personnel in the field. This allows for automated actions when certain conditions are met, such as turning off sensors on a specific frequency if they’re detected by the sensing system. “Anything we can do to help him concentrate on the objective and reduce his workload was one of the objectives of the [quick reaction capability],” Srivastava said. Dotson identified another concern related to computing capacity. He said the Army is eyeing lighter versions of the capability that could be available for lower echelons, which may not need the modeling and simulation required at higher echelons. “We’re looking at ways to tailor it specifically to the echelon, and then that will help us with the platform we need to put it on,” he said. The modeling and simulation might be important at the staff officer level, he added, but he questioned whether that computing power is needed at the micro-tactical level. Dotson noted that this process of providing a needed capability and assessing soldier feedback have allowed program officials to identify potential burdens on the tactical network. Regarding the future of the program, Dotson said capability drop 3 was approved last year, and the Army is in staffing for capability drop 4, the last of the capabilities as slated by the initial program timeline. Dotson added that capability drop 4 is “absolutely” influenced by what has been learned in Europe.